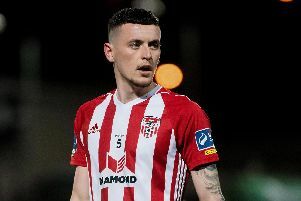 Rory Patterson’s brace gave Derry City a superb boost in Bray on Monday night, the Strabane man having led the front-line with great tenacity and commitment. Ably assisted by midfield playmaker, Barry McNamee, who controlled that area, Kenny Shiels side looked solid in the vital areas and, if the truth be told, the “Candy Stripes” were never seriously troubled. So Derry City’s season is now up and running and the recent back-to-back wins will provide the necessary confidence boost as the Brandywell side now prepare to host Galway United this Friday night. Centre-back, Aaron Barry, broke the deadlock after just six minutes, the Arklow man heading home McNamee’s deft chip back into the area after Bray keeper, Peter Cherrie, had parried Patterson’s solid shot. Having huffed and puffed in the final third afterwards, Derry were never tested defensively and, predictably, Patterson put the game to bed in the 72nd minute when he finished off a fluent move involving Harry Monaghan. The striker’s second strike, his third goal in three matches, arrived at the death when he weaved his way into the Bray penalty area to plant the ball in the net after rounding the over-worked keeper. Bray Wanderers - Cherrie, Douglas, McNally, Marks, Byrne, Brennan, Creevy, Salmon, Moore, Lewis, Finnegan. Derry City - Doherty, Vemmelund, Jarvis, McBride, McCormack, McNamee, Monaghan, Patterson, McGlynn, Curtis, Barry. Referee: Mr. Rob Harvey (Dublin).